During the film�s finale, Bond and Sanchez battle it out in tanker trucks over a stretch of highway known as the Rumarosa Pass in Mexicali. While filming a scene where a tanker exploded, a special effects crew member was taking photos from behind the scenes. When he looked at his photos later, he saw what could only be described as a flaming hand reaching down from inside the explosion. Even more eerie, director John Glen went through every single inch of footage filmed that day, frame by frame, and couldn�t find the hand anywhere else. In addition to the flaming hand, the crew of Licence to Kill had all sorts of other mishaps over the course of filming. While filming a scene where Sanchez shoots off a Stinger missile, the prop stinger went haywire and hit a utility worker on a telephone pole more than two miles away. Other examples include the truck that mysteriously burst into flames in the middle of the night for no reason, the truck that started its engine and drove a few feet with no one behind the wheel and the apparitions that the security guards reported seeing that disappeared when challenged. Were these all just random and freak occurrences or was there actually a higher power at work during the filming of Licence to Kill? Director John Glen thinks there might be, as evidenced by a quote from his book, For My Eyes Only. �There was definitely a strange atmosphere on that stretch of road. The special effects boys where convinced there was something spooky about the place. If there was any doubt left in my mind, it was dispelled by a bizarre photograph�� While we will never know for certain, it sure is fun to speculate. 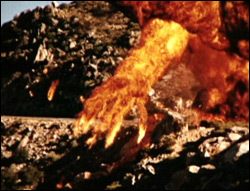 As you can see from this selection of screen grabs of the actual flaming hand scene, you can't find it anywhere.